I ate it for lunch with a jacket potato but it would make a beautiful accompaniment to fish, particularly mackerel. Toss the diced pumpkin in the olive oil, salt and pepper and roast in the oven at 200C for 15-20 minutes (check it with a knife – the pumpkin is ready as soon as it softens). Prepare the dressing by mixing together all the ingredients, then heating in the microwave for 20 seconds to thin the honey. Mix again. 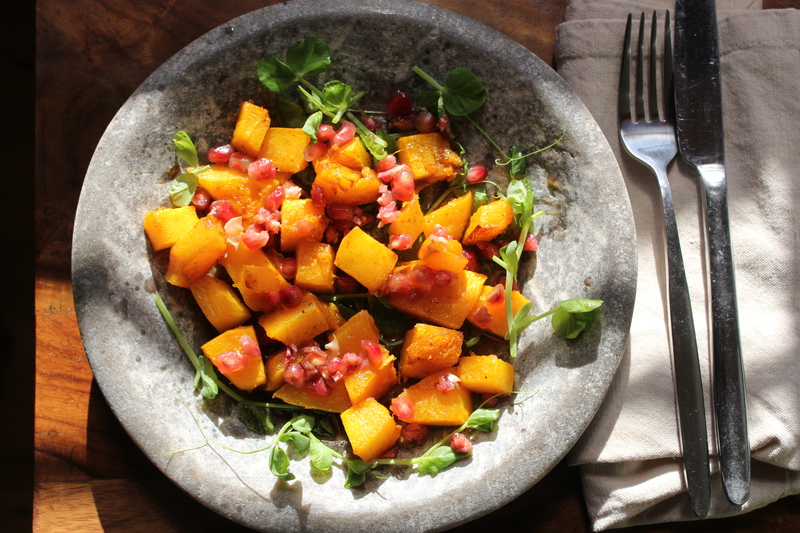 Arrange the pea shoots on a plate before scattering the roasted pumpkin on top. 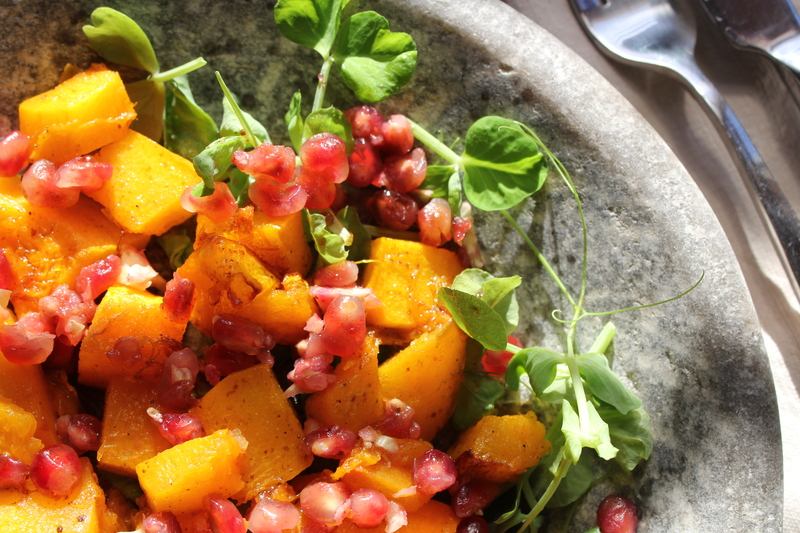 Squeeze the seeds out of the pomegranate half onto the salad (You probably won’t need to use the whole half of the fruit; I saved the excess seeds and the juice from my half and stirred them into my porridge the following morning). Looks gorgeous and you’ve reminded me to sow some peas for pea shoots. Did I really? Yes I do like it. I’ll bet M remembers where I found it because I don’t. Doesn’t the salad look great on it? Good choice! Oh darn it! He’s onto me! I agree with the colour being so beautiful. Unfortunately, the only way I find pumpkin appetising is in cake. Sigh! Ahhh… well I can’t deny that pumpkin is lovely in sweet bakes too!